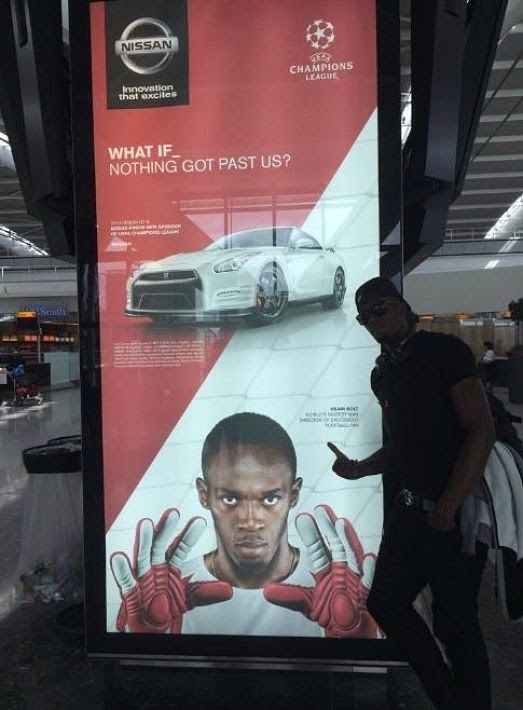 COME FLY WITH ME: The athletic superstar standing next to Nissan's latest promotional ad featuring his image. Unsurprisingly the summer-early fall months are when people like The World's Fastest Man see their frequent-flier miles soar to new heights. For the sprint king, this year has proved to be no exception. For the past several weeks at least, Usain Bolt has been continent-hopping to delightful and exotic destinations, with his Jamaican flair, exuberant bravado and reliable sidekick Nugent Walker (Team Bolt's Executive Manager) in tow. Following that gold-medal-winning stint at the Commonwealth Games in Glasgow, it was on to putting in an appearance at the European Athletics Championship in Zurich, Switzerland, where he caught up with good friend and fellow track powerhouse Mo Farah. Bolt has a thing for the UK and Brazil, so naturally a bit of club-hopping in London and a return to the picturesque Copacabana Beach in Rio de Janeiro soon followed — complete with a 100M win (over pal Wallace Spearmon) and shiny new medal to add to the stash. Imagine that: It's also a season of firsts for the jet-setter who recently competed for the first time in his career in Poland (at a memorial meet in Warsaw). And come September 2, he'll be in India, the land of Bollywood and the Taj Mahal, but his trip isn't necessarily for the cultural connection. Instead, he's been invited to headline a seven-a-side cricket exhibition match as part of a PUMA promotional activity, against none other than 2011 World Cup hero Yuvraj Singh. The match-up has been generating huge amounts of buzz in the blogosphere and is expected to draw a global audience. And as part of his current world tour, Bolt will also be hopping over to Beijing (the scene of his 2008 record-breaking Olympic exploits) to add some star power to the launch of Nissan's sparkling new GT-R model. As for where he'll show up next, he'll certainly keep us all guessing, but rest assured that the Director of Excitement will be reporting for duty.